ZAWIYA, Libya - Rebel fighters claimed complete control of a sprawling oil refinery in this coastal town yesterday, seizing one of Moammar Khadafy’s most important assets after just three days of fighting and delivering the latest in a string of small victories that have suddenly put the rebels at Tripoli’s door. Despite what rebel leaders described as fierce fighting, many of them expressed surprise that the Khadafy loyalists were routed with relative ease. Some people even wondered whether the chaotic exit by about 50 of the regime fighters - who fled by boat before they were bombed by NATO warplanes, according to several fighters - was some sort of a ruse. The six-month history of the Libyan conflict is filled with similar predictions made by one side or the other, usually in the face of nettlesome facts. Even so, the rebels have taken a substantial swath of territory in western Libya over the past few weeks, and Khadafy’s forces have not mounted a forceful counterattack. There were other signs of a conflict that had reached a critical moment, if not its final stage. For days, the vital highway from Tunisia to Tripoli has remained closed, controlled by the rebels in a harsh blow to the Khadafy government, which relies on the road for supplies of food and fuel. Thousands of refugees are also fleeing daily from Tripoli, some to escape the city’s mounting hardships but others expecting that they would be safer in rebel-held areas. On the road, they passed through checkpoints staffed by increasingly confident rebel fighters, many of them toting new machine guns supplied by one of several foreign allies. Perhaps the clearest sign of collapsing morale in Khadafy forces was found in dozens of miles of untouched farmland, between the town of Bir Ghanem, the site of a large battle several weeks ago, and Zawiya. Khadafy forces retreated along the road between the towns last week, ceding 55 miles and hardly putting up a fight, rebel fighters said. As their foreign allies searched for a way to end the fighting, the Libyan rebels tried to seize more territory and perhaps gain leverage in their negotiations. Their successes have at least temporarily shifted attention away from the rebels’ internal divisions, laid bare by the assassination of their top military commander July 28. There also remained the possibility that the rebels, as they have in the past, would advance beyond their ability to hold their ground. And the Khadafy forces, despite signs of weakness, have not stopped resisting. Even as the rebels have extended partial or total control over key coastal towns, including Sabratha and Surman, west of Zawiya, there have been reports of Khadafy loyalists shedding their uniforms and continuing the fight inside those towns. 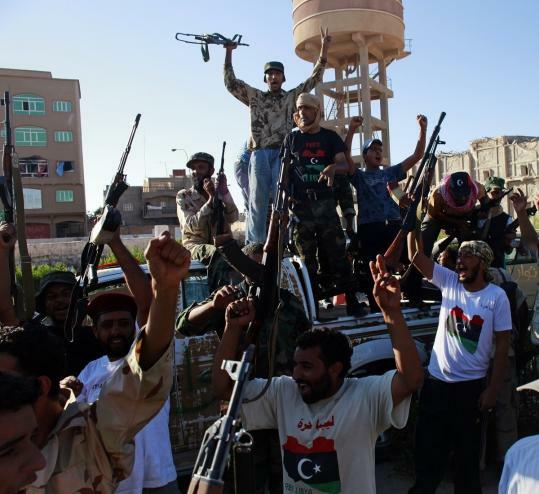 Rebels said they were in control of the city of Gheryan, which straddles another crucial supply line to Tripoli. Clashes were reported yesterday within a few miles of the city, Reuters reported. A few miles from the port at the oil refinery, where fleeing Khadafy soldiers left their green fatigues on a dock, snipers shot at rebel fighters in the center of Zawiya, which is still held by government loyalists. The six-day struggle for Zawiya, the last major city on the western approach to Tripoli that Khadafy forces had managed to hold, has now settled into fierce fighting on two fronts, rebel fighters said. There have been continuing clashes around Zawiya’s eastern entrance, and in the center of town Khadafy soldiers have take up positions in a traffic circle and in several buildings, including a bank, a hospital, and a hotel that was under construction. Yesterday, the hotel caught fire, sending a column of black smoke above the city. The Khadafy soldiers still committed to the fight appeared less capable than the troops that had repeatedly driven back the rebels in the early months of the war. The mortar attacks this week - regular, and still deadly - lacked the precision of the strikes that used to send rebel soldiers fleeing en masse from towns such as Brega and Ras Lanuf in the eastern part of the country. As the smoke from the hotel provided cover for the rebels, they gathered their dead, including two men whose bodies had been sitting in the road for days. Eissa Korghly, an engineer turned fighter, used his pickup truck to take the bloated bodies wrapped in floral blankets to a graveyard, where several men helped bury them. A few miles away, Khadafy soldiers still had positions, a gravedigger said. Korghly picked up his shotgun and turned his truck around, headed back to Zawiya.